Application: germanium wafer used in production of semiconductor device, infrared ray optical device, sinking material of solar cell. Germanium (Ge) is the preferred lens and window material for high performance infrared imaging systems in the 8–12 um wavelength band. Its high refractive index makes Ge ideal for low power imaging systems because of minimum surface curvature. Chromatic aberration is small, often eliminating the need for correction. Germanium is most widely used for lenses and windows in IR systems operating in the 2 um - 12 um range. Its transmission is very temperature sensitive, becoming opaque near 100°C. Environment does not cause problems because Germanium is inert, mechanically rugged, and fairly hard. Germanium is a high index material that is used to manufacture Attenuated Total reflection (ATR) prisms for spectroscopy. Its refractive index is such that germanium makes an effective natural 50% beamsplitter without the need for coatings. 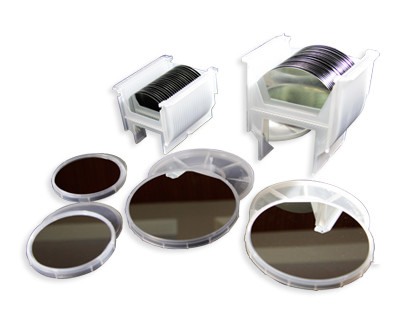 It is also used extensively as a substrate for production of optical filters. Germanium covers the whole of the 8-14 micron thermal band and is used in lens systems for thermal imaging. It can be AR coated with diamond producing an extremely tough front optic. Application as window, lens, beamsplitter, ATR prism or filter in spectrometers and in thermal imaging. we can provide 6 inch VGF method "zero dislocation" solar cell with germanium substrate enterprise. Products are widely used in space satellite solar cells at high power, high altitude reconnaissance uav, the ground concentrated solar power plant (CPV average photoelectric conversion efficiency is double times of the silicon solar power station, ultra-high brightness LED substrate used car. The factory has successfully developed an 8-inch solar germanium substrate with an international leading level, which will lay the foundation for future market expansion. A: (1) For inventory, the MOQ is 3pcs. (2) For customized products, the MOQ is 25pcs up. For customized products: the delivery is 2 or 3 weeks after you place the order. (2) For the special-shaped products, the delivery is 4 workweeks after you place the order. Q: how is the way of shipping and cost? A:(1) We accept DHL, Fedex, EMS etc by 100％ in advance before delivery. (2) If you have your own express account, it's great.If not,we could help you ship them. Freight is in accordance with the actual settlement. Q: Can I customize the products based on my need?